I received my diploma in the mail yesterday and this has prompted me to clear my throat, in a manner of speaking. Since November 2013, when I began my descent into the valley that would become my masters applied project and final semester of graduate school, my outward interactions and consumption of social media dropped to a faint heartbeat; then even that went out as I began two final courses over the summer to finish graduate school and complete my credential to teach at the local community college. All my attention narrowed to one, single activity: final project and graduation. My personal and professional obligations were as automated and on-hold as I could manage. 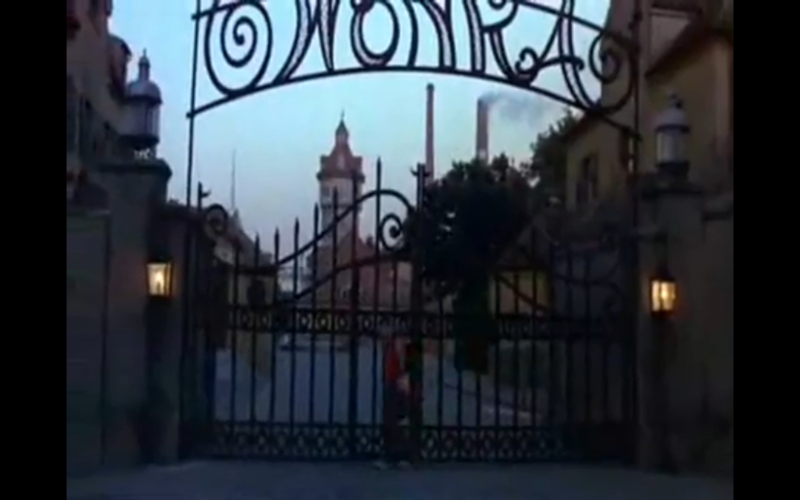 An image from the original film Willy Wonka & the Chocolate Factory. I feel like my academic factory has been shuttered for a long time and I can’t even use the excuse that I was busy rescuing Oompa-Loompas. It is the week of Labor Day and the diploma has arrived. It’s as good a time as any to reboot that work that resides in the overlap of my professional work, my personal life, and my academic aspirations, yet doesn’t truly have a place of its own. I’m not so clear in my next steps that I am going to initiate a new blog for this and future posts, although my applied project did entail setting up a resource blog. I believe the space I’ve got here will be fine for now, as I reconcile my new work activities and the areas on which I am to focus. So, I’ll tweak the scope of this blog yet again and it will be a venue for my considered opinions and reflection on higher education as I conduct my work within it; as well as more personal-professional inquiries as I inhabit my sliver of the internet and the account I make of it; in addition to hosting new and continuing pet projects. DS106 Daily Create assignment in photography (#673 for 11/11/13). Details: Bonnard said, “You can never have too much yellow.” Prove it in a photograph. Learn more about Bonnard’s reasoning with his painting of The Yellow Boat (from the Tate). For this Create, I had to resist the temptation to do something typical like take a picture of a banana or a lemon, but I couldn’t get passed those images. I knew I just had move through them to get to the creative side just as it’s helpful to free write morning pages to purge one’s mind for new thoughts. I went to the kitchen and set up the bananas next to the lemons in front of the yellow wall in the kitchen. The interesting thing about that yellow wall is that when my wife (Darla) and I moved into and renovated this house I advocated for all white walls, everywhere. It was our first house together and I felt that this new life chapter (not only a new home but our first home together) warranted white, white, white. Dar had a different take on this and instead wanted color, color, color! In the end, each room of the house had an accent color and it has made such a difference. In the kitchen, we went with yellows and oranges; colors that Dar and I haven’t particularly favored in the past but for some reason we’ve come to like. 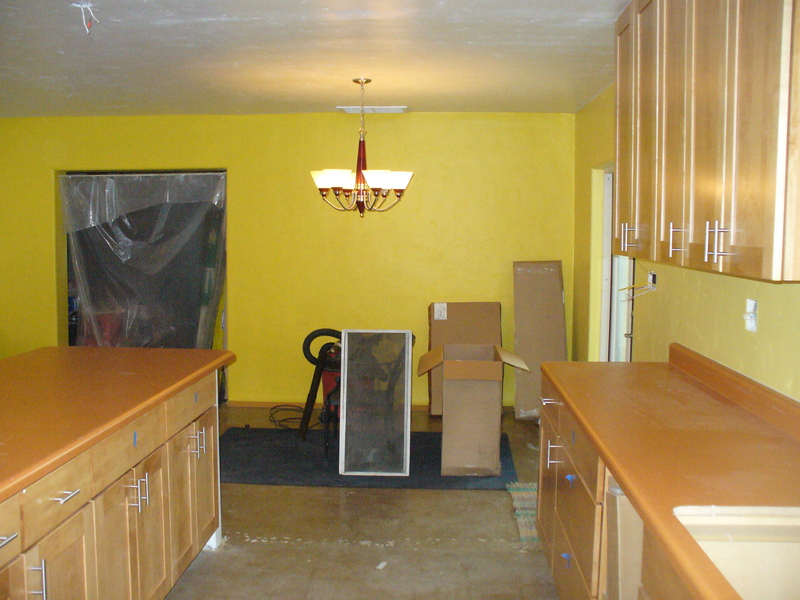 We painted the two walls in the “great room” (combination kitchen, dining room and living room) with shades of yellow and accented them with Formica countertops in the pattern called “Atomic Orange” (which you can see from my first ever Daily Create back on January 21, 2012). The yellow walls are her “special walls” upon which she hangs all of her favorite art and sentimental gifts. Like Bonnard, Dar thinks you can never have too much yellow. Sunshine inside: yellow walls and orange counter tops. Image by Seth Goodman. So I took my photograph of the bananas and lemons and yellow wall and our daughter walked in with her friend at that moment and asked me what I was up to. I explained and she still thought I was behaving strangely. 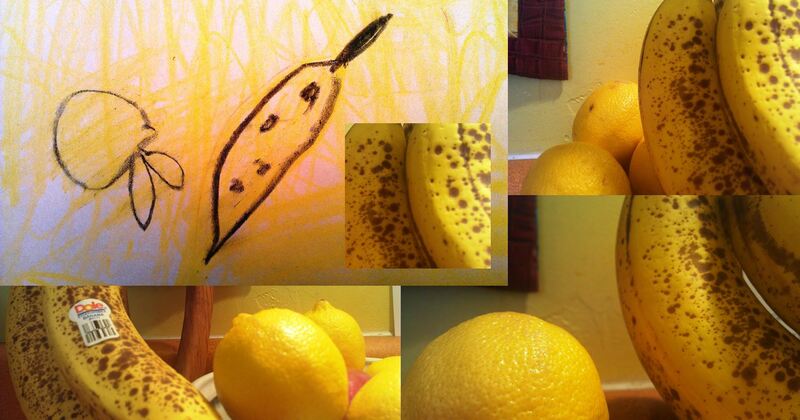 So as I sat at the computer thinking about where to go with this very ordinary photograph, my daughter walked in with a quick crayon drawing that she and her friend made for me: a banana and a lemon in front of a yellow wall. It seemed like she was making an effort to be helpful but it’s really her way of saying: “Dad, you’re weird.” I loved the drawing and thought about how I might incorporate it into the Create. From there, I made a quick connection and decided to create a tile effect with a few more pictures to compose several images of the original, “very ordinary” composition. I admit I enhanced the yellow-factor in these pictures with the auto-adjust in Microsoft Picture Manager. What I like best of all in the Daily Create exercise is that it provides a conduit for storytelling: bringing story in to the project, creating story in the process, and taking a story home with you when it’s all done. It may not be “yellow” but I agree you can never have too much of it. This post counts as 500 words of expressive writing towards my unspecified goal of “lots more” writing in the month of November for Academic Writing Month. Even though I first learned and first loved to write in a journal and on a manual typewriter I won’t be doing any of that sentimental crap during Academic Writing Month. It’s all computers and mobile devices for me…inelegant but efficient. Image: cc (CC BY-NC-SA 2.0) flickr photo shared by Dave King. I recently discovered Laura Pasquini’s blog when I was directed to her post regarding Academic Writing Month (AcWriMo). 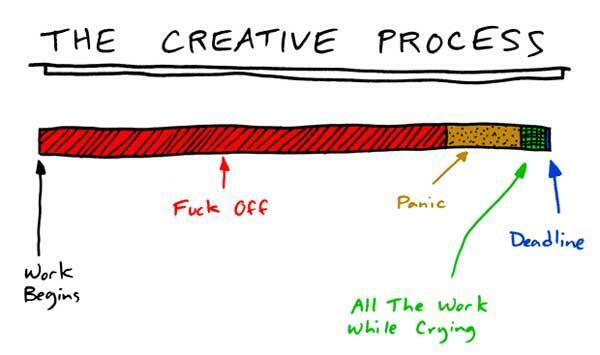 I particularly liked her selected graphic on the creative process which should in no way be construed as a confession regarding my own creative process (but I do think you should check it out and bookmark it — I have). The timing could not have been more “near-perfect” since I am now embarking on my masters thesis for graduate school. Of course, perfect timing would have been today, which is when I intend to actually begin my participation in #AcWriMo starting with this post. 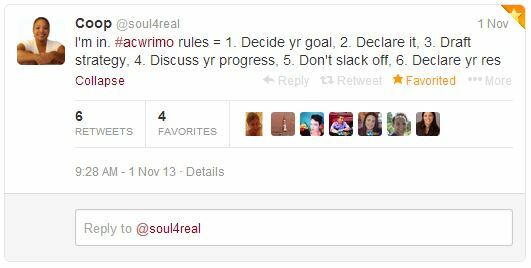 Apparently, I should have known about AcWriMo, since @soul4real and @alicedaer (a.k.a. my professor) have already been tweeting about it since day one. Alice’s tweet made me aware of Laura’s blog in the first place and also the official AcWriMo Twibbon. The educational return on my investment is already apparent as I’ve learned to create my first-ever Twitter widget for WordPress as a way of demonstrating my commitment to #AcWriMo through November. It should motivate and inspire “visitors” to my blog; i.e., me. How did I miss this tweet?? If @soul4real says “I’m in” consider it a cross between Mom’s best advice and the voice inside your head; …in other words, what are you waiting for? Alice performs a Jedi mind trick on me. Of course I will help support AcWriMo. I have been assimilated. Decide on my goal: For the remainder of the month, my goal is to complete my course project for English 654: Digital Literacies and Social Media. This work will form the basis of my thesis so getting the project drafted by the end of the month is a goal and also a first major step. Declare it: Consider it declared, here and now. Draft a strategy: Here’s where it gets a little too simple. Let’s just say I’ll be writing in the evenings (after work, after putting my kids to bed) but I’ll jot down notes and prompts throughout the day to make my writing time focused. Strategy will just have to be a work in progress for now. Discuss your progress: I’ll keep myself accountable by commenting on my progress through blog posts. Declare your results: Successes and unintended slacking will be blogified. My blog will be garnished with the #AcWriMo Twitter feed for the month of November 2013. Strategy revisited: A couple of points do come to mind. The first is that by just setting the intention to write, and doing it in such a public way, is motivational for me. Another strategy is to get inspired. I came across this great post on writers’ routines on Brain Pickings and that got me a little jazzed and focused. And then I remembered something a buddy told me about Jerry Seinfeld’s strategy to simply establish a habit, make it visible on a wall calendar and keep the pressure on to sustain a chain of successive “good” days. Check out this related post on Lifehacker.com. I’ve got my Twibbon, my #AcwriMo widget is up and running with a recent tweet from Laura. Game on. Every once in awhile I take a moment to reflect on the ubiquity of cameras. They are everywhere as stand-alone devices, but they are also embedded in our phones, they rest on our computer monitors… even when we wait in line to buy a candy bar at a convenience store. They are up there in the ceiling, to the left or to the right. Sometimes they are dead center, which makes it easier to look at the camera and directly at yourself in the monitor. I like to be able to look at myself straight on. It is a little… “disconcerting” is too dramatic a word — it’s a little frustrating to look at a monitor and see the side or angle of my face. Being the subject of gawking, whether by another or by my own self, is just as uncomfortable. But looking straight on, in the eyes, is okay; it’s honest. All of these cameras taking image after image, which are fed back to us, is an extraordinary stream of self. I can wonder and marvel at this because I grew up when it took months to go through a precious — not to be wasted — roll of film. Back then, it was a time when it took a week or longer to get those films developed. Seeing ourselves reproduced was not so common then as it is now. At that time, the only “selfies” were the ones you made yourself. I drew frequently when I was young. 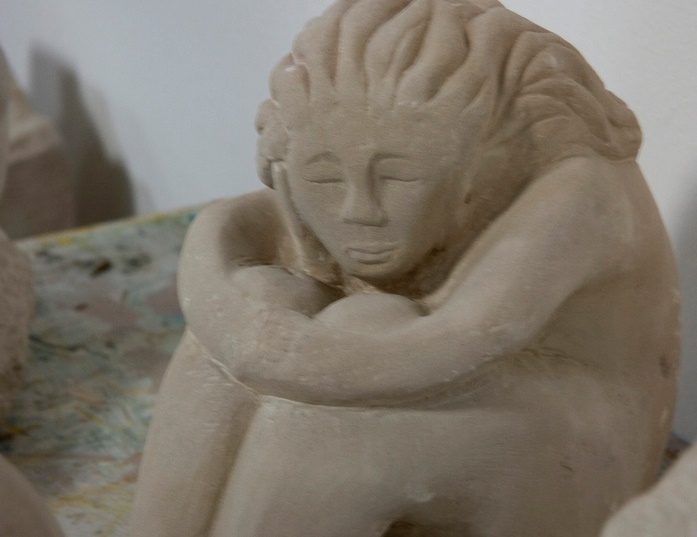 My mother encouraged my artistic inclinations but she also gave discriminating feedback. Accolades were different for a large pen-and-paper canvas of spaceship battles then they were for say a simple pencil sketch of the family cat. I can only imagine that she saw the soul of the work as different; that perhaps the work of drawing X-Wings and TIE Fighters was an imagination, a fiction, whereas rendering the presence of an Other was about negotiating a relationship. She really honored those works. She encouraged my sister and I to draw self-portraits. Over the years, I’ve done a number of “old-school” selfies but I admit I come to make them much less frequently. 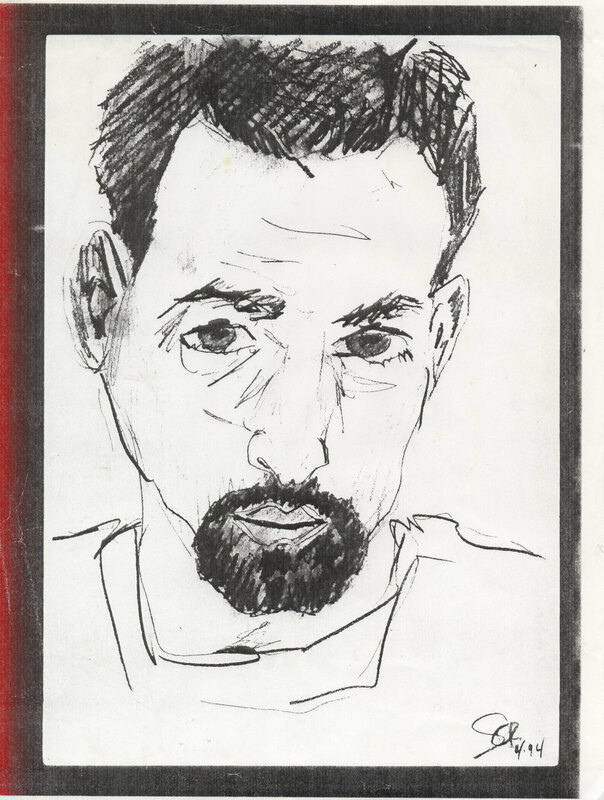 In the past 20 years, I’ve only made 2+ self portraits (I’ll explain the “plus” soon). 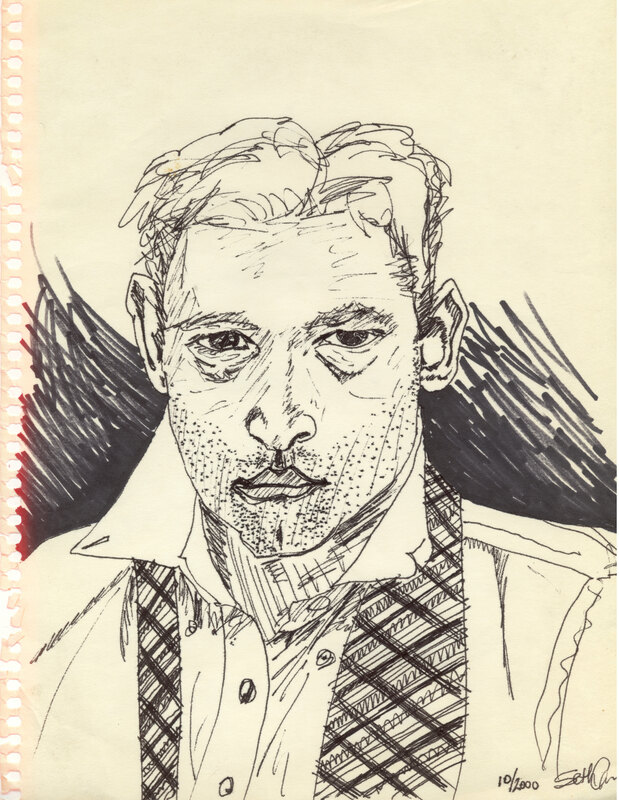 What interests me the most about them is that the spirit in which I’ve come to make self-portraits in my adult life is when, frankly speaking, I’ve been at a very low point in my life; in fact, dejected, self-loathing. In hindsight, it occurs to me that this visceral need then to pull myself in front of the mirror and draw what I saw was about a desperate need to renegotiate my relationship to Self because, presumably, I’d lost it somewhere along the way. In both cases, I was in front of a bathroom mirror — I had taken my lonely self to the “alone” room; where we perform catharsis, we hold a space; where we re-present ourselves before going back out in public. The current “temple of my familiar” has challenged me to evoke an image that represents emerging from a crisis (see The Daily Create #635). It didn’t take long after holding a quiet space before my mind drifted to these old self-images. When I contemplated why it had been over a decade since my last “selfie” I wondered if the emerging use of social media avatars might be the way I am re-presenting myself now…to others and to myself. Might these past self-portraits have also been a form of avatar? My life now is so different and distant from 1994 and 2000, when I was weathering storms and made these two self-portraits. But I still use the tools available to make those self-portraits with the little time available to me. And I’m thoughtful about them. After all, they reflect how I see myself, and I see myself as being in a pretty good space. Contemporary selfies and self-portraits, otherwise known as social media avatars. Let me leave you, my guest, with the remarkably sublime “Le Long De La Riviere Tendre” by Sebastien Tellier. To my tender heart, this music speaks to me of “emergence.” It reconciles me from 1994 to now, approaching 2014. When I read the Daily Create assignment (#632) for today, one of my initial thoughts was that I wanted to resist the temptation for using digital media. I was instead moved to create something physical/tangible (and perhaps photograph or scan it). I instantly acknowledged I had a desire to draw. My second thought was that I need to get started on these daily creates way early in the day because once I head to the office, I can’t get to it until after we’ve put our girls to bed and the household chores are (as) done (as they’re going to get). Considering I’m Jewish and Jews begin the day at sundown, I’m fairly confident that midnight deadlines don’t apply to me. And my third (and contradictory) thought — just now — is this, having a whole day to percolate an idea and not act on it is a sweet incubator for art. I reflected on the idea of maps and going places and alternate routes and I was just really in a cerebral space today so any attempt to think about going to a location just wasn’t sticking for me. I didn’t want to be too cutesy or clever. I eventually came around to thinking about how people arrive at conclusions, make judgments, render criticism and all manner of “closure” without acknowledging that they have options when they try to make things so certain. These choices have emotional consequences, they impact trust, and they can really tire us out. Yet, of course and in their own way, all of these routes do serve a purpose. 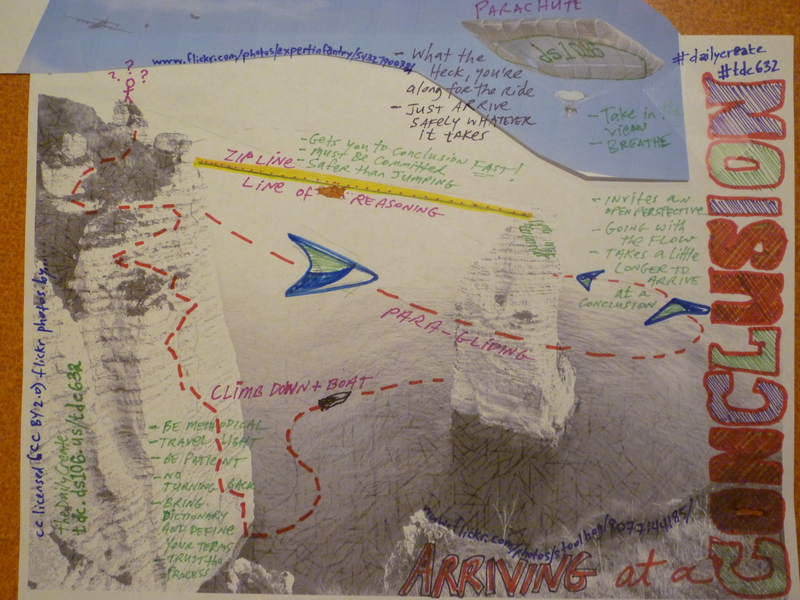 Arriving at a sketch: this is the preliminary sketch I made to think through the image, map, and theme. With my theme in mind, I resolved not to go with premade photos. Yet, with the evening closing in, my drawing skills and confidence waning, I made a concession. I thought if I could find a picture to help me along, even just to trace or sketch from, I’d be okay with that. I brought up Google Image Search and looked for images matching “cliffs” and “fog” (my original sketch incorporated fog) and then “needle cliffs.” This last one turned up some amazing photos of a cliff in Northern France near Étretat. I went to Creative Commons Search looking for similar images on Flickr and scrolled down hoping for a good pic. Many of them were lovely, in color and far away; obviously by tourists trying to capture the breathtaking enormity of the cliffs, but fortunately, I found an image that was so crisp and stark, in black & white no less, that it just pinched my brain. I was moved to leap to that cliff out there. It compelled me to actually open up Google Earth to try and zoom in on it. I found it and checked out much of the coast of Northern France…for my next wish I…but I digress. I took the image and got one of the larger sizes because I wanted detail even though I knew I was going to modify the contrast, but I wanted to start with a good amount of detail. I opened the image up in MS Picture Manager even though I’ve got a few good image managing software packages (including Adobe Photoshop) but this is the one I know how to use quickly…and, man, the night is almost over. I flipped the image into reverse to approximate the original sketch I made. My secondary go-to for image manipulation (until I take the time to become more sophisticated) is actually MS Word (Artistic Effects) and I use the format picture menu to apply some interesting filters. In this case, I went with Crisscross Etching, holding the contrast at “normal” to keep those great details and dialing up the brightness to +20; a little lighter than I desired but I wanted to ensure I could draw over it once I printed it out with enough image retained so it was immediately apparent we were looking at a bluff and a cliff. In this over-eager version I fail to include “jumping to a conclusion” as an option. With my base image, and a crazy compulsion to repeat the image of a parachute jump that I used on the Daily Create the day before, I had my canvas. At this point, I took my sketch, a limited selection of markers and found the most comfortable spot in the house not already occupied by a cat. No process to report here; I just had joyful time completing my map and adding little details and nuanced meanings to the overall map-message, complete with hyperlinks. There are a total of five alternate routes to a conclusion. One point worth mentioning is that the original impetus of this project was the notion that people jump to conclusions and yet I “completed” my work (or so I thought) and almost uploaded it to Flickr before I noticed that I did not include “jumping to a conclusion” as an option. Touch up ensued. Now that I think about, concluding in itself is just another option. I am “dropping in” once again to the DS106 community and getting settled…in a running-to-catch-up sort of way. I know that within this open, creative community there is no judgment about “being behind” or “needing to catch up” but there is a pace that one doesn’t simply step into but must ramp up to. I’m chugging along, cutting my vegetables as I put them in the stew. There are design assignments to take up, peer blogs to read, community art/making to peruse and cheer on but for now there is me, ramping up and building my confidence, one Daily Create at a time. Today, the Daily Create assignment (#631) was to list twenty ways I can document my learning and note how many of these methods I’ve done so far this week. Spoiler alert: maybe, I’ve done none of them. 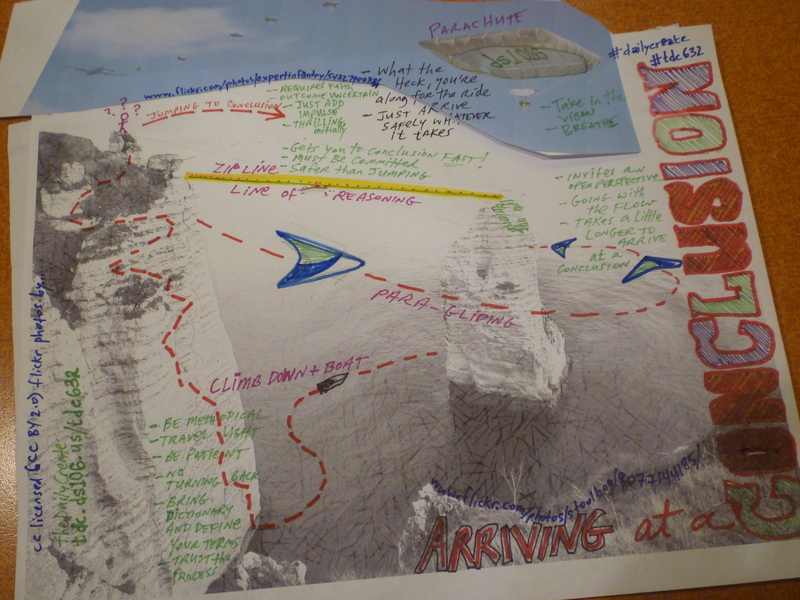 But for me this was a really interesting exercise because I immediately applied my old thinking to the question/problem and nearly dismissed the assignment as super-simple (a bore really)…and then I began to reflect a little. And I found that I couldn’t quite get my pointy head around it. I found myself getting stuck as I really attempted to honor the question of how I document the learning…; perhaps, the moment-of-learning-acknowledgment. I jotted some thoughts and notes initially and I really enjoyed having this conundrum to come back to, again and again, throughout the day. The act of posing this questions created a stable space for me — a home base for me to return to — as I moved throughout the day. I believe this was a gift. While I could delve deeply into this for days or even a week, I see the value in making art and moving on, or thinking my “thinks” and clearing the canvas. My responses, along with the responses of other DS106 chums can be found by going to the assignment (linked above) but I’ve also included my response below. But if pressed for a concise answer, I find myself returning to the remarkable short video of Jim Gee talking about the silliness of giving a test to someone who just made it through a computer video game (e.g., Halo). He gently argues that the act of completion is evidence of learning. 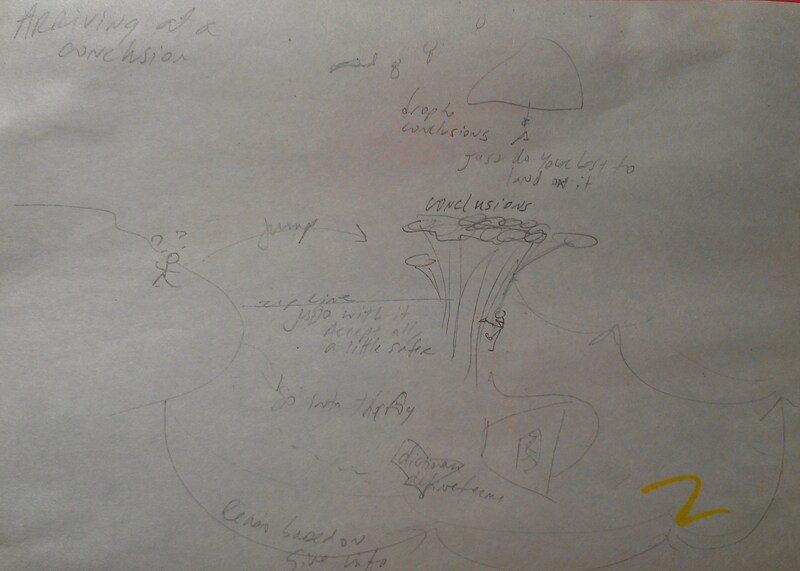 It would likewise be silly to ask the parachutist in the image above to document the learning of parachuting. The act of a safe landing is all the documentation we need, no? Is that documented learning or the sound of one hand clapping? This exercise seemed easy until I actually began to break it down to the core…and then I was stuck just nibbling around the cookie. I can’t say I actually identified the dynamic of learning; maybe process, maybe product. But the ineffable taste of melted ice settling in a glass or the sound of abrasive moonlight…these are easier to capture than the open moment of learning. The One Story/Four Icons challenge for an unspecified episode of The Twilight Zone. Ever since I heard about the One Story/Four Icons design assignment I wanted to try it out. For this week, I’m taking a stab at it. I learned about the Noun Project from @IamTalkyTina via her blog post of the same design assignment. I learned about the site/community, registered for an account and started searchin’ for just the right images, resolved to make my own icons if I couldn’t quite get what I needed. After some give and take, between discovering icons and reconsidering how to capture the essence of The Twilight Zone episode I wanted to represent, I got what I needed. I do not have and SVG viewing/editing tool so I simply captured the icon images from the browser using the Microsoft Windows 7 Snipping Tool and pasting them into a canvas in Microsoft Publisher. I removed the gray background by dialing up the contrast to +40% and then — just to be different — shifted from all black icons to progressively darker gray icons, the last being black. I offset the whole mess with accent lines above and below. You may leave your guess as a comment below… but you only get 11 tries.